I got home tonight just in time to see some of the footage of the fire at the Grand Pier in Weston-Super-Mare. 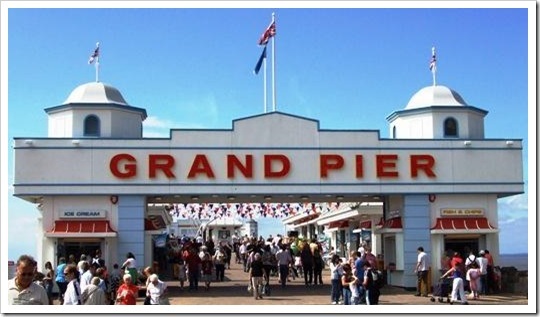 The Grand Pier is very much a key piece of the Weston landscape, and a landmark of the sea-front. Weston was a great part of my childhood, with frequent family day-trip by train to the town though summer. It must have been a logistical nightmare – usually at least 6 adults and 4 children – up for an early train loaded up with provisions for the entire day. The visit to the Grand Pier, and pouring a hand-full of 1p pieces through the one-armed bandits was always a much anticipated way to cap-off the day. I’ve heard from two cousins to let me know of the bad news (thank-you, Linda and Nicola), that’s some sort of an indication of what this place means to us all. Yes, we had freezing-cold days on the beach there, and showery days, but we were on holiday. But it was deck-chairs, buckets and spades, sand-castles, ice cream, fish and chips, and the Pier were what Weston was all about. Last year, on our honeymoon, Mrs CannibalRabbit and I managed a flying visit just after the Pier had closed-up for the day, and we had fish and chips on the promenade. Then I had one of my childhood questions answered; what’s it like when everyone has gone home? Just like it is during the day – only without all of the people. Now I just wish that I had bothered to walk down the sea-front a little way and got a photo from the other side of the pier, into the sunset. The BBC have now launched a Weston Pier micro-site covering the fire. It includes comments and before, during and after photos – well worth checking out.